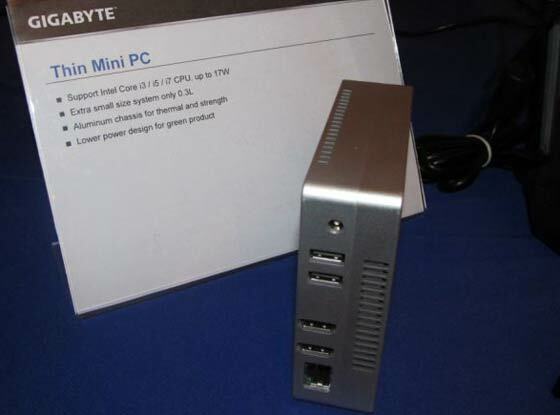 Gigabyte has an interesting all-aluminium mini PC case on display it its booth at the CES. It looks to be the same size and shape as an Intel NUC system but this Gigabyte mini PC has more powerful components and a better selection of I/O. Like the Intel NUC, the new and as yet unnamed, Gigabyte mini PC is a 4-inch square box. For reference, the current Apple Mac mini is 7.7-inches square. Gigabyte’s vented aluminium case looks a lot nicer than the Intel NUC we had in the HEXUS labs. 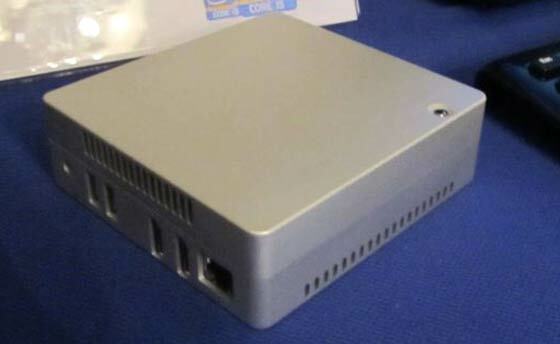 The size of the unit and arrangement of the back ports suggest it contains a tweaked version of the Intel NUC motherboard design. Reports late last year suggested a new NUC system would get a thunderbolt connector and the Ethernet connection would be retired but that isn’t the case with Gigabyte’s new mini PC. Liliputing had a touchy-feely session with the new Gigabyte mini system and reveal that the “Thin Mini PC” has USB 3.0 connections (where the Intel NUC was USB 2.0 only), HDMI input and HDMI output ports, an Ethernet connector and built-in Wi-Fi. The device supports up to 8GB of RAM, an Intel Core i7 chip and 256GB SSD. Has a low power design so is therefore a “green product”. Gigabyte also told Liliputing that the system will be “priced competitively — at least for an entry level model”. The prototype in these pictures may get a few final design touches before the expected April launch. Acer launches Helios 700 gaming laptop with sliding keyboard Nvidia GeForce RTX 2080 Ti overclocked to 2.94GHz Nvidia partners detail their GeForce GTX 1650 graphics cards Intel Core i5-9400 QOTW: What wattage is your power supply? In theory, but find me a monitor that takes resolutions over 1920x1080 over HDMI. Or an intel CPU for that matter. I've got a Dell 30" - it takes 2560x1600 over DP or DVI but not HDMI … my ivybridge will output 2560x1600 over DP only … here's hoping haswell will fix that.